The Island Club is pleased to present Rigadin Peintre Cubiste, an exhibition which explores the portrayal of fictional artists on the big and small screens. Rigadin Peintre Cubiste is a 1912 French silent slapstick comedy directed by the prolific Georges Monca and produced by Pathé Frères. 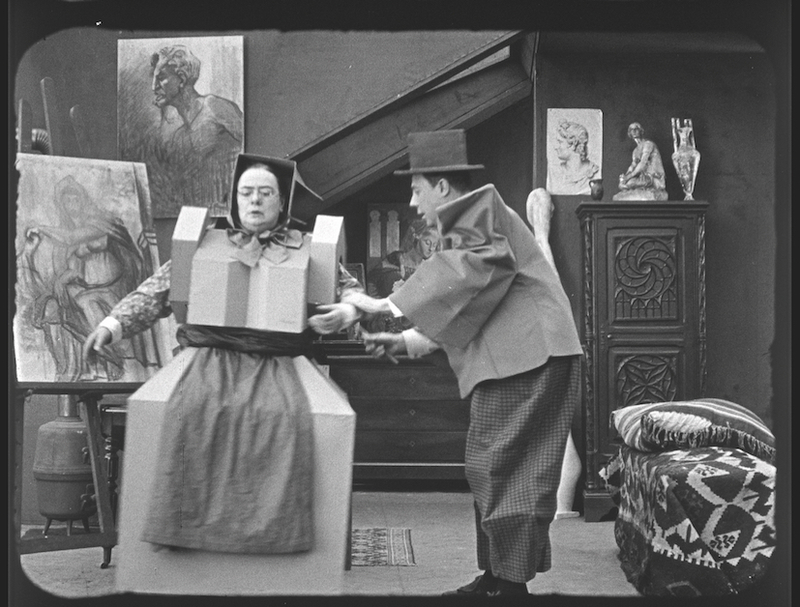 Rigadin—portrayed by Charles Prince Seigneur, one of the biggest film stars in the world in the years leading up to World War I—returns home from the first “Salon des Peintres Cubistes” with an urge to (re)create his own Cubist reality. Released in the same year when Gleizes and Metzinger’s Du “Cubisme” (the first major essay on Cubism) appeared, Rigadin Peintre Cubiste constitutes the archeology of popular culture’s satirical engagement with the values of “high art” at the very peak of this subversive avant-garde movement. In dialogue with Rigadin Peintre Cubiste, the compilation I could have done that… develops as an open archive attempting to map the presence of fictional artists as characters in a number of TV series and movies. Within the array of material, ranging from clichés, stereotypes, caricatures, and ethographies, a selection of diverse portrayals of fictional artists in media culture are assembled and put into perspective. I could have done that… has been compiled by Denise Araouzou in dialogue with the extended family of The Island Club, colleagues, and friends. The first chapter of this open archive was edited by Adrian Melis. Rigadin peintre cubiste (1912). Directed by Georges Monca. Production: Pathé frères 1912. © Fondation Jérôme Seydoux, Pathé frères. With special thanks to: Anestis Anestis, Stephen Akehurst, Dafni Bechtsi, Mara Berger, Helene Black, Bianca Maria Fasiolo, Zedillo Fernando, Delia Gonzalez, Assaf Gruber, Evi Hadjipieri, Chrysanthi Koumianaki, Katia Krupennikova, Jess Linden, Florent Meng, Zlatko Mićić, Eliana Otta, Thodoris Prodromidis, Bobby Paul Sayers, Sofronis Sofroniou, Korallia Stergides, Maria Toumazou, Myrto Vratsanou, Silke Wittig and Vasilis Doritis (Lifestyle Technologies).